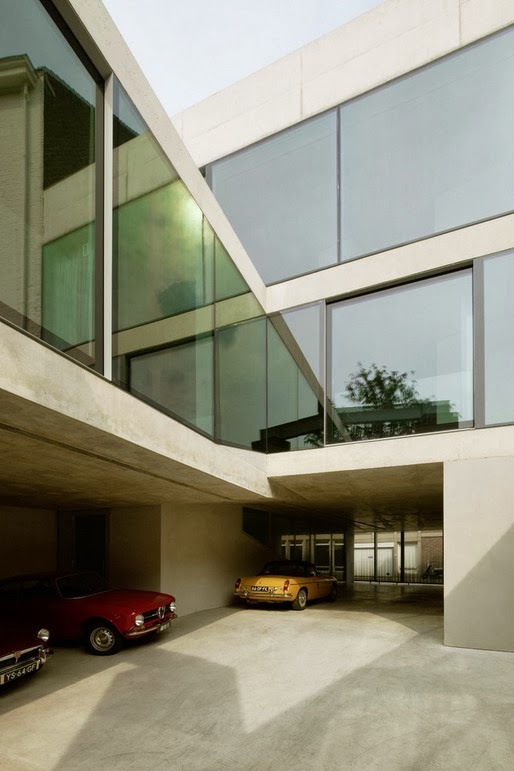 Located within the medieval tapestry of Maastricht, this recently completed family house was designed by Wiel Arets Architects for a couple that collects vintage cars. 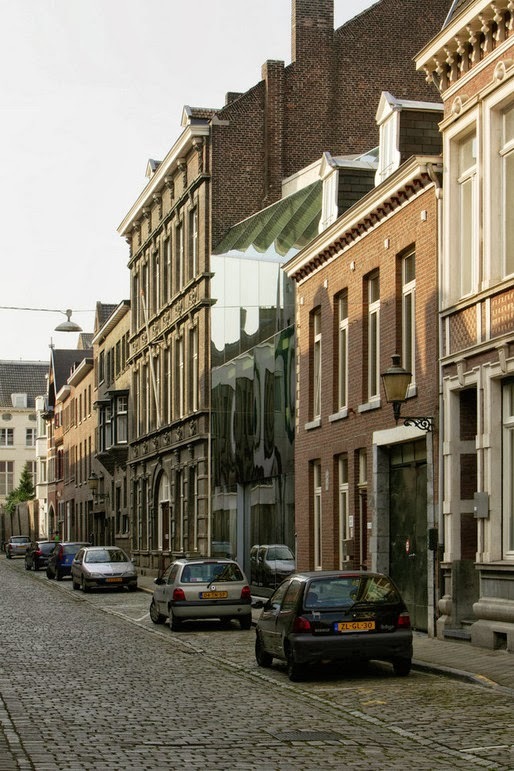 The simple, geometrical, shape of the house is all contemporary in its heritage context, following the envelope of pre-existing buildings according to city’s orders. The building with the open, minimal glazed facade stands out between its historical surroundings. 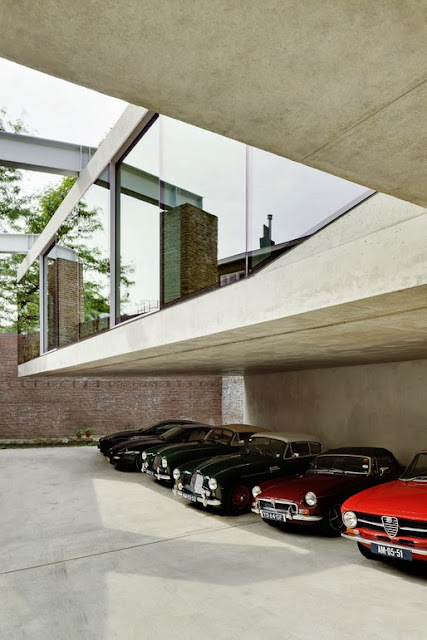 The living room floats over the collection of Aston Martins below, suspended from two I-beams and steel tension rods. 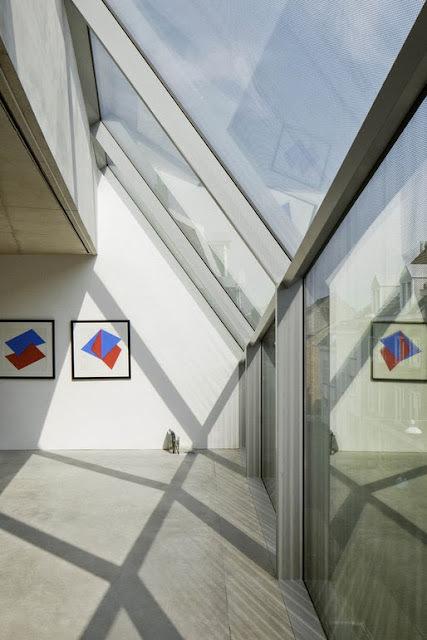 The city dictates all new structures remain within the envelope of pre-existing buildings, and so a cut was created in the house’s front façade to generate a triangulated surface, which leads from one neighbor’s sloped roof to the opposite neighbor’s vertical bearing wall. 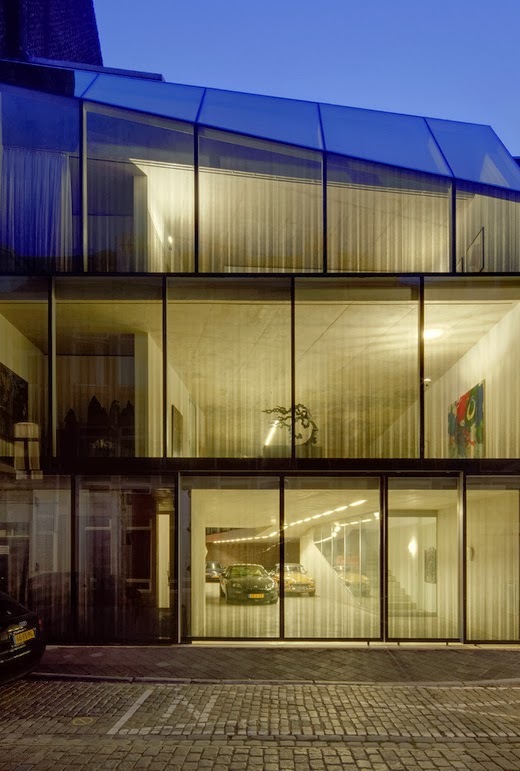 V’ House was constructed for a couple that collects vintage cars, and is stitched within the medieval tapestry of Maastricht. The city dictates all new structures remain within the envelope of pre-existing buildings, and so a cut was created in the house’s front façade to generate a triangulated surface, which leads from one neighbor’s sloped roof to the opposite neighbor’s vertical bearing wall. 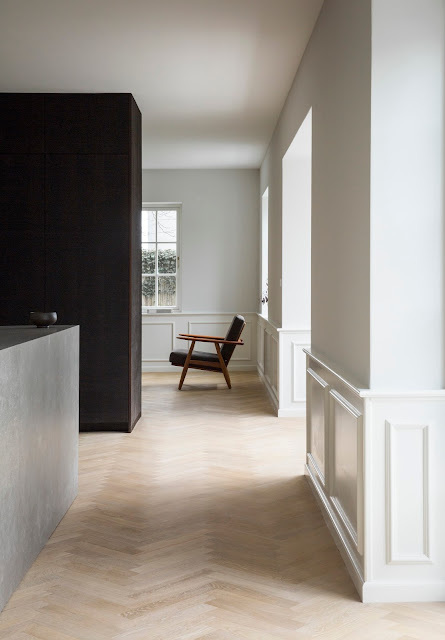 As the house’s site is long and narrow, voids were cut into the maximum permitted volume to ensure that natural light spills throughout the interior. 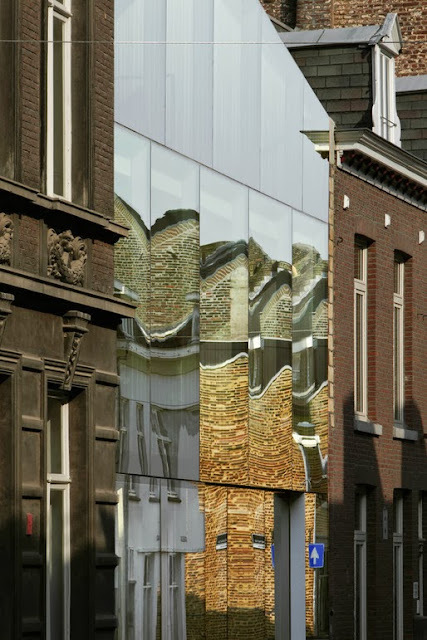 The ground floor is both open to the exterior elements and sunken to the rear of the site, which makes possible the maximum two-story height allowance. 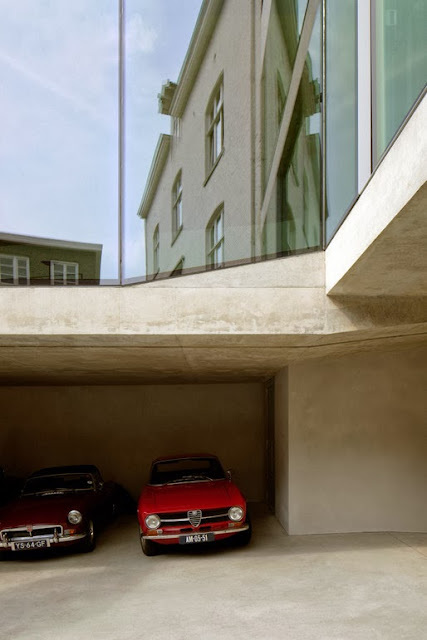 A covered portion of this exterior space serves as an outdoor parking garage for the owners’ collection of Aston Martins. 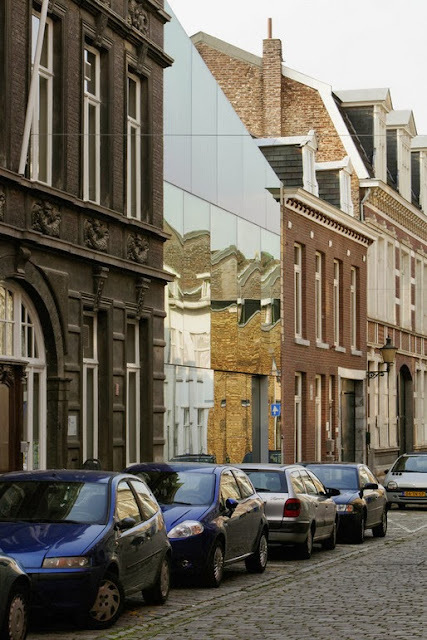 As the house finds refuge between two historical buildings, it is a burst of modernity within this currently gentrifying neighborhood of Maastricht. The house is enormous, totaling 530 m2, and is entered through two oversized sliding glass doors that perforate its front façade. 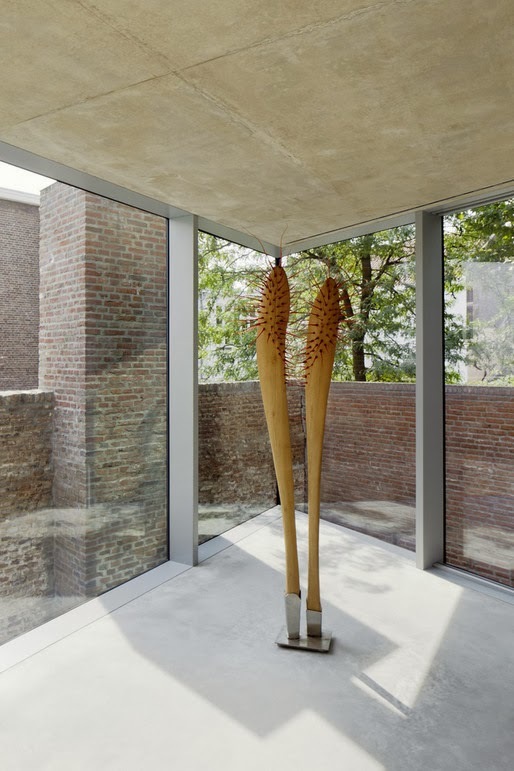 These doors serve as the house’s main entry and open to either their left or right for entry by foot, and both simultaneously retract to allow the entry of automobiles. Due to safety and privacy concerns, these glass entry doors have no handles or keyholes and are instead are remotely opened from any iPhone, from anywhere in the world. For further privacy the house’s front façade was fritted with a gradient pattern of dots, which disperse in placement as the house rises towards the sky and focus at a distance to compose an image of curtains fluttering in the wind. 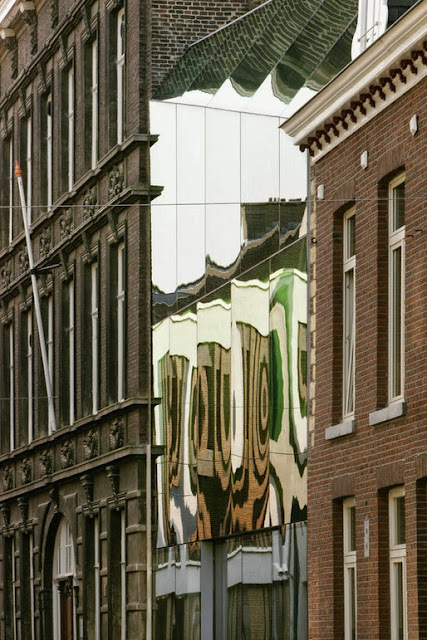 Actual curtains align the interior of the front façade to afford additional privacy. Circulation throughout the house occurs via two paths. 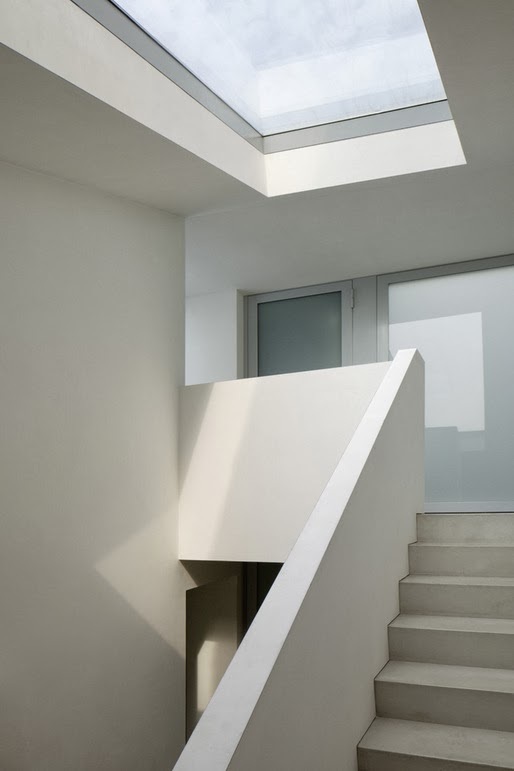 A 'slow' stair leads from the ground floor to the expansive living room, which is connected to the partially raised kitchen and dining areas by a small ramp. 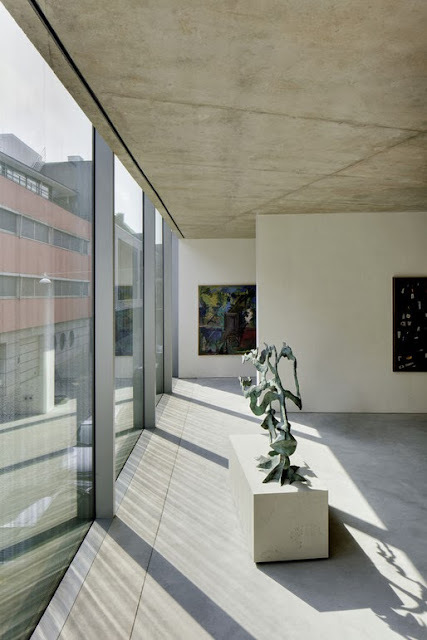 A 'fast' stairwell traverses the entire height of the house and, together with the platform elevator, allows for direct vertical shortcuts to all levels of living. 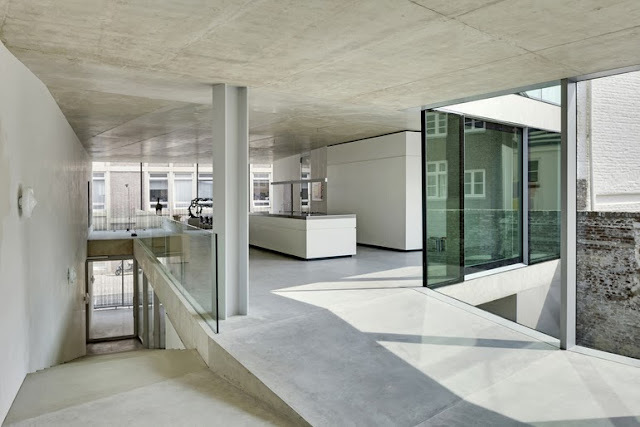 Thus this house, with its multiple circulation interventions, such as its living room ramp and ‘fast’ and ‘slow’ paths, is organized not around the traditional notion of stacked floors and is instead organized around its circulatory section. 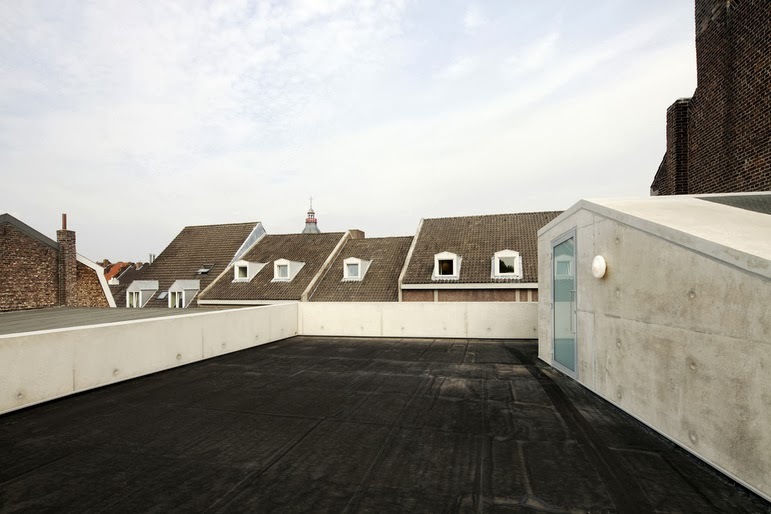 At the apex of this 'fast' route is the entrance to an expansive roof terrace that’s also the most public space of the house, as it offers panoramic views over the spired roofline of Maastricht. The living room has been suspended from two I-beams that span two masonry bearing walls that surround the rear of the site. Steel tension rods measuring 5x10 cm extend from these I-beams into the almost fully glazed façade of the living room, which allows its volume to float above the Aston Martins below. For privacy reasons, this glazing was treated with a highly reflective coating that casts a hue of chartreuse or amber depending on the season and angle of the sun. Only when inhabiting the master bedroom is this hanging of the living room apparent, as the I-beams are visible from the master bedroom, which opens onto the living room's roof, which functions as a private terrace for the owners. 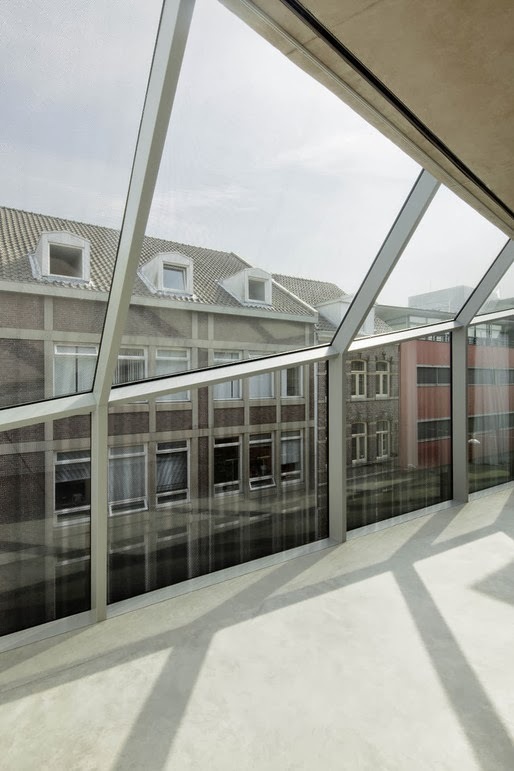 Heating and cooling is provided via a concrete core activation system concealed within the floors and ceilings of the house, while all storage is built into the circulatory areas in order to divide spaces and define rooms. These custom designed storage units also outfit the office space, where they conceal a bed that can be lowered to accommodate temporary visitors, such as the owners' now grown children. 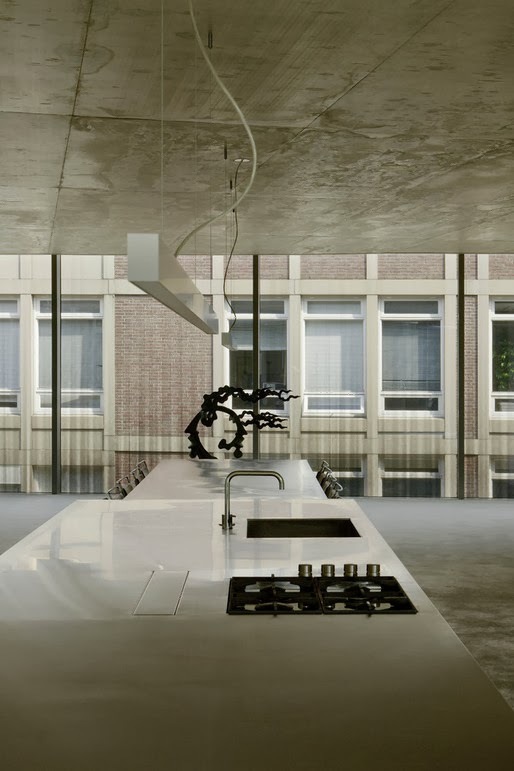 All storage areas recede in prominence due to their fluid integration, which allows the house's interior to remain flexible and open for ephemeral definition. The one-piece custom designed kitchen was constructed in stainless steel, and the dining table, which is connected to it, cantilevers 3.5 m toward the front façade. The custom furnishings and storage spaces, together with the in-situ concrete and multiple roof terraces, make the V’ house an expression of free space in a regulated heritage context.